By D.L. Davis on Monday, February 4th, 2019 at 2:02 p.m.
Attorney General Josh Kaul (left) and Gov. Tony Evers. Tony Evers was sworn in as Wisconsin governor Jan. 7, 2019. From lame-duck bills to the Affordable Care Act lawsuit, PolitiFact Wisconsin readers are interested in all things Tony Evers. It’s not that Evers is new on the scene; he took office as state schools superintendent in 2009. But the newly-installed governor, a Democrat, certainly is new as the state’s top executive. Fact-checks or articles about him took four of the top spots in our High Five for January. Evers stepped into a much brighter spotlight Jan. 7, 2019 when he was inaugurated governor. He defeated two-term Republican Gov. Scott Walker. 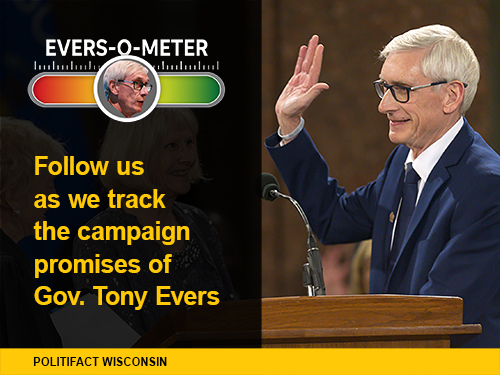 The November 2018 campaign created an extensive record for Evers on the Truth-O-Meter. In an article, PolitiFact Wisconsin took a look at fact-checks done on statements by, and about, Evers -- emphasizing ones that provide insight into what to expect from him as governor. 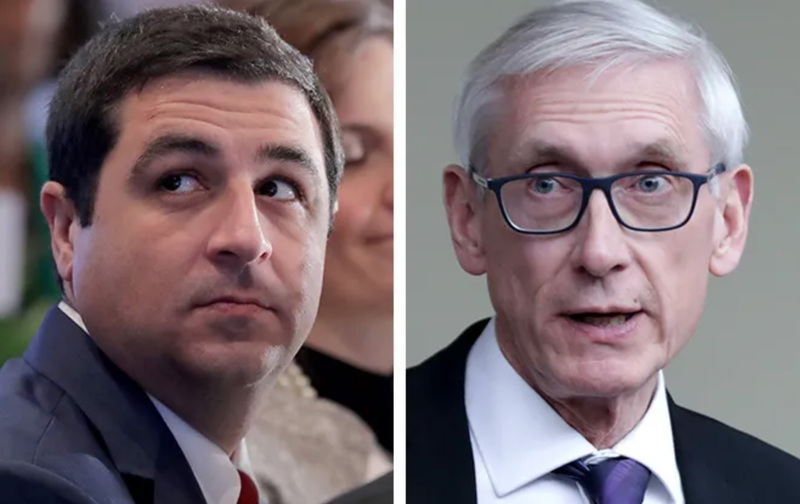 A series of lame-duck actions — approved in a special session of the Legislature and signed by Walker — changed a variety of things, in many cases giving the GOP-held Legislature control over matters previously left up to the governor and attorney general. In an interview on WISN-TV’s "UpFront with Mike Gousha," state Senate President Roger Roth, a Republican, described the legislation as "just some common sense oversight measures put into place." "The end result here is there will be more legislative oversight in a lot of areas, but no power was taken away from the governor," said Roth, R-Appleton. "Power was not taken away from the attorney general." We rated it Pants on Fire. Evers was a vocal critic of the state’s economic development agency on the campaign trail, and once elected was in position to do something about it. The Wisconsin Economic Development Corp. is a public-private partnership that oversees grants and loans given to businesses in exchange for the promise of new jobs. The agency has been mired in controversy for years amid bad loans, failures to verify created jobs and a critical state audit. WEDC replaced the state Department of Commerce, thanks to action by Walker and Republicans. Evers pledged to reverse that move — returning economic development to a state agency -- and to defund the agency in his first budget. Republican lawmakers threw a wrench in those plans in December 2018 when they temporarily limited the governor’s role in WEDC as part of a package of lame-duck bills. As governor, Evers said he would not address WEDC in that budget and claimed he was "never certain" he would address it that way. We rated his position a Full Flop. One of the hallmarks of Evers’ campaign for governor was his support for the Affordable Care Act, known as Obamacare. One part of that was a pledge to withdraw Wisconsin from a multi-state lawsuit seeking to overturn Obamacare. "The people of Wisconsin voted for a change this November and asked us to stop playing politics with their health care. That’s why I’m announcing tonight that I have fulfilled a promise I made to the people of Wisconsin by directing Attorney General (Josh) Kaul to withdraw from a lawsuit that would gut coverage for 2.4 million Wisconsinites who have pre-existing conditions." Less than 24 hours later, all that was off after the nonpartisan Legislative Reference Bureau issued a memo that said Evers doesn’t have the power to get Wisconsin out of the lawsuit under the GOP-passed lame-duck measure. With lightning speed, Evers went from an applause line boast of taking action to fulfill a promise to basically stating a political position: That he’s opposed to the lawsuit. That was a complete reversal. And, in our book, a Full Flop. The plight of Wisconsin’s dairy farms has been well documented, with farmers struggling to hang on in the face of low milk prices and high costs. Some are losing thousands of dollars a month. The numbers show the 600 is in the ballpark among dairy farms. While dairy farms make up a small percentage of the state’s overall farm total, recent years show a downward trend there as well. And we know dairy farms were especially battered in 2018. Additionally, it is clear at least some state farms -- particularly those involved in dairy -- are being negatively affected by the shutdown. We rated Baldwin’s claim Mostly True.